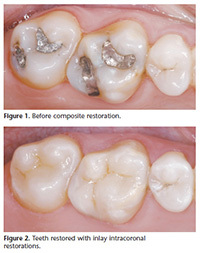 We offer all restorations, from metal-free fillings and bondings to crowns. Choosing a filling that is right for your particular circumstance requires us working in partnership with you. You can always count on us to keep your mouth healthy, whole and beautiful. Early detection of decay and cavity treatment is important for patients of all ages. Consistent exams, cleanings and conservative repairs can help keep the teeth's natural strength and beauty without the use of metals or waiting for things to become worse and more difficult to treat. Remember, dental decay is the number one chronic disease of children, so don't put off a healthy start for your child. We like to catch cavities as early as possible so that we can preserve your tooth structure and strength. In fact, when some tiny cavities are caught early enough, they might be filled without the use of local anesthetics.